I’ve always loved Art Museums and have been working at the Seattle Art Museum for 13 years. It seems as though I’ve gotten to install paintings by just about everyone that has graced an art history book with my own two hands. It’s been inspiring to see the works up close, but it’s also wonderful to work with so many other artists who help contribute insight into the work at the museum and my own artwork. It was actually a SAM exhibition that rekindled my love of Dutch still-life paintings, “European Masters: The Treasures of Seattle”. I chose to make this month’s still life painting of Brussels sprouts for two reasons. I love that the vegetable is named for a city in the region where these paintings reached their maturity, and they are one of the only vegetables growing in my yard right now (the rabbits love them!). See more Monthly Miniature paintings from this and past series in the Monthly Miniature gallery. Happy New Year everyone! I’m celebrating the new year by starting a new Monthly Miniature series. For each month of 2019, I will create a miniature still-life painting in the Dutch Still-Life tradition and I hope you will enjoy following along. As a newsletter subscriber, you’ll be the first to see them, and they will be available for sale as soon as they are announced. Still-life paintings from Northern Europe were at their prime from around 1600 – 1800 and they often feature blossoms, insects and food that could not be found out of hibernation or in season at the same time. They are constructs of seasonal impossibility, pieced together from earlier studies, signifying impermanence and the perception that earthly life is transitory. In Season pays homage to Northern European still life, while also contrasting modern and past experiences. Expectations have changed; perennial availability is the norm now, and seasonality is hardly acknowledged. In Season features combinations of fruits, flowers and insects that occur together naturally, in appreciation of the beauty of the cyclical and ephemeral. The first painting of “In Season” features the camellia flower and cave cricket. The camellia is one of few flowers in bloom here in January, and you may also be startled to find a cave cricket in your basement. Most insects are dormant this time of year, but these little creatures are actively scurrying around ready to frighten unsuspecting people in cool dark places. This month’s miniature portrait of brothers features the sons of artist Jennifer Zwick. Jenny is a fixture in the Seattle art community, and I’ve known her since long before she had kids. I’ve always been a great fan of her work, her contagious grin, and her breathtaking beauty (I’ve nicknamed her Snow White, and yes, she is the fairest of them all!). I did a painting of Jenny once upon a time, and I’ve been excited to make a portrait of her boys. I originally imagined a classic miniature, but these two just didn’t quite fit the mold. Jenny sent me dozens of images, some of which fit my original idea, but there were so many goofy shots. These kids are definitely raised in a very creative household, and I felt more and more that their portrait should reflect this. There were several images that fit, but I love the expressiveness of the two of them in this image in particular. You see so much about their relationship, and capturing it in a painting was worth the madness of painting such tiny faces and hands. This is the smallest-scale portrait I’ve made in a long time, and if I never work so small again, I’ll be glad the last time was for Jenny. Please take the time to enjoy a peek into her life as an artist mom, through her words and images below. Please visit the gallery of Monthly Miniatures, and learn more about all of the Artists featured in the series in the Archive. My first thought is to write about how the restrictions of parenting have affected my work: how, when I was first pregnant, I could no longer build large sets, so instead made tiny wearable rooms (which I call “head sets”) with dollhouse hardwood floors and framed artwork which attach magnetically and look hilarious and unreal; or when I was pregnant a second time, and so large I could barely move, and my art grew even smaller still, making miniature watercolors of Nintendo game systems. But if I focus away from how parenthood makes one’s artistic career smaller (no residences; harder to attend openings; expensive child care; higher stakes and confusion about if making art really is a priority), I see that it was a very natural thing for me to incorporate parenthood into my artistic practice and output. Before pregnancy, my work often focused on what I experienced as a child – things I thought might be possible, or wished could happen, or might as well have. My obsession with optics, with the disconnect between how our senses literally perceive the world, and then how our brain translates these into the impression of a coherent experience, this was amazing to see firsthand as my children learned about object permanence, or how proximity affects scale (older son’s first airplane trip: “when do we get small?” since he’d only ever seen airplanes flying overhead, in perfect miniature distant detail), or what aspects of a world we will completely take for granted, and what sticks out as wrong, or as special, or as notable. One ongoing photo series of mine involves building set-based narrative photographs depicting young girls in surreal circumstances, staging remembered childhood ideas and atmospheres. I was recently able to create several new images, and for the first time, there are adults – two of the photos have mothers; one with her daughter, and one hugely pregnant. During my first pregnancy I had a show called “Partum” which was hung in three sections: First Trimester, Second Trimester, Third Trimester – the work was all very distinct, as I adjusted to giving up Ritalin, then as I became anemic, and then as I dealt with acute nervousness and humor about the impending birth. Recently I revisited a photograph I made for that first “Partum” show, which was about how the female body is treated as a public object. For that photograph I stretched chaotically patterned fabric on a frame, cut a hole in it, and stuck my third-trimester belly through. Photographed head-on, it is a strange exercise in depth, with the flat fabric directly parallel to the picture plane, and the belly jutting out, impossibly round. In the new iteration, I mounted the life-sized photo on foam core, cut the belly button out, and attached it to a small motor which I wired to rotate, comically spinning in the middle of this huge belly, just as weird and humorous and insane as it is to grow a freaking person in your body. Whenever possible, I love having my kids help with my projects, building or installing or whatever won’t 1) derail the project 2) ruin everything or 3) kill them. Additionally, making large-scale art projects means I end up with interesting and odd materials – one project involved taking site-specific photographs of banal locations at Seattle Center, then printing them out life-sized and reinstalling them on location as photo opportunities. In order to ensure I had the exact right focal length and composition I made several rounds of large black and white test prints at copy centers. I did not end up creating a piece at the Kobe Bell Pagoda location, so my then 5-year old son had a great time using all the huge images for his own purposes. One of them became the backdrop for a “play” he wrote about ghosts, and we brought it to the pagoda and he performed the play (which involved a surprising amount of jumping in dried leaves). From Jennifer about her artwork: Trained in photography, I work in a variety of media, including large-scale installations, wearable sculptures, painting, interactive video installation, printmaking, and photographic processes. I am particularly interested in optics, symmetry, humor, one-point-perspective, anxiety, repetition, repetition, and repetition. I create artwork which requires the viewer to reorient themselves, using one-point-perspective, in- camera techniques, site-specific construction, and sculptural installation, presenting nonlinear narratives depicting the fraction of a second where something fundamentally concrete is shifted just enough to turn an ordinary moment into something gently surreal. I firmly believe that by making art which looks fantastical but is constructed rudimentarily, “in real life”, an opportunity is created for the viewer to think about what we will accept as real; about how much our brains miss when we move through the world; about what we take for granted and how much power we truly have to reshape our reality. Sean, the happy kid featured in this month’s monthly miniature, is the son of artist Barbara Robertson. I was first introduced to Barbara in the basement at the Seattle Art Museum many years ago and have been following her brilliant career every since. There is a fear for many women that their career will not recover after being put on hold to raise kids. That is no less true for artist moms, who deal with the additional challenges in being a woman artist who have historicaly been less recognized in museums, galleries and art history publications. Every step forward in a victory, and Barbara is another inspiring example that it can be done. Among other things, the story she tells below highlights how powerful it is to have a role model. Thank you Barbara, for being another incredible inspiration! Paintings in this Monthly Miniature series fall somewhere between commission work and my original works. Like a commission, source images for these miniatures may come from family photos or be taken by me. But whereas I involve clients in my commissions, both in selecting photos and composing the painting, I take full control in the Monthly Miniatures. Most parents see these portraits for the first time when you do, here in the newsletter. I love the process of composing a painting in collaboration, but having complete freedom gives me a different connection to the painting, and it is helping me develop confidence in my choices. Barbara (far right) pictured with her family. Her son Sean (left middle row with green hat), husband, step children, grandchildren and nieces and nephews. When my son was born, I really didn’t know what it was like to be an artist, or anything else, except being a young girl. I had wanted, and dreamed, of being an artist since I was fourteen when I met my first professional, working artist. I was full of the enthusiasm and optimism of youth. She was the mother of my best friend. I had not dreamed of being a mother. But when I had my baby at age 19, at least I had a great role model for how to be an artist and a mother. My friend’s mother had a studio in her home, with a door that she kept closed; her own private space. I was often invited in to see her work and receive her advice when I was in high school. My baby was a surprise, of course…who plans a baby at 19? I was a freshman in college, so had taken a few introductory courses and loved it. I was determined to get my degree in art and determined to get my MFA, which I did. It took me ten years, going part time, to get my BFA. I was so naïve, that I did not know that no one takes you seriously as an artist if you are a woman and certainly not if you are a mother. If someone had told me that, I would not have believed them. I had my friend’s mother as an example and I just proceeded as if I had no impediments. By the time I was in graduate school, my son was ten, and being a parent and a beginning artist was much easier but still a challenge. I was always juggling commitments to find time to make some art. My son often came to UW with me in the evenings and rode his skateboard down the halls of the art school building befriending and charming some of the other students. Being a young parent definitely has its advantages; you can carry your child around for a long time without getting tired, have endless energy and certainly no carpel tunnel stress that most mature mothers experience. You have lots of stamina and optimism but, the downside is that you are not very smart. And you don’t know what you don’t know. I’m pretty sure that was a disadvantage for him. So my son and I grew up together. He went everywhere with me and lived around creative people and “alternative” life styles and was always a welcome part of the group. This has, I think, contributed to him being a tolerant, wise, independent and intelligent person. As he got older, I devoted more of my time to my art and I think that he thinks that having an artist mother is a natural thing. He is a self -employed craftsman and an amateur chef. Seattle based artist Barbara Robertson is known primarily for her work in experimental printmaking. Recently, she has expanded her practice to include digital animation and sound installations. Awards for her work include grants from the Seattle Office of Arts and Culture City Artists program, 4Culture Individual Artists award, 4Cullture Artists Projects grants, Artists Trust GAP grant, a KALA Art Institute Fellowship and the Neddy Fellowship from the Behnke Foundation. In 2004 her work was included in “Events,” a collaboration with the Merce Cunningham Dance Company, Joyce Theater, New York. In 2012, her work in animation was exhibited at the 4Cutlure Electronic Gallery in Seattle, in 2012 at “aproject space” in Seattle, Washington, at Trykk 17 Art Center, in Stavanger, Norway and at the Eleftherias Art Center in Athens, Greece. In the winter of 2013, her animation “Three Phases,” was exhibited on a large outdoor screen at the Gates Foundation in Seattle. In 2014, three animations and one work on paper were part of a large special exhibition at the Tacoma Art Museum, titled “Ink This! Contemporary Print Art in the Northwest.” Robertson’s work shown in 2014-2016 as part of “The Intersection Between Science, Art and Technology” exhibition at the American Embassy in Bern, Switzerland. In 2015, her work in animation and print was exhibited at “Impact”, Hangzhou, China. Three animations were shown in 2016 at 4Cullture’s E4C electronic gallery. Robertson’s work is included in private and public collections including the State of Washington Percent for Art, King County Public Art Collection, the City of Seattle Portable Works Collection, Harborview Medical Center, Tacoma Art Museum, University of Washington Special Collections, US Trust and Safeco Corporation. She has a Master of Fine Arts degree from the University of Washington, Seattle. She established the print art program at Pratt Fine Arts Center in Seattle, served on Pratt’s board of directors and is the founder and past president of Seattle Print Arts. In 2016 she curated and organized a satellite exhibition in conjunction with the Seattle Art Fair, “In Context” exhibiting large scale work by thirteen regional artists. In 2017, her large scale, sight specific animation installation, “Architectonic” was exhibited at Oxbow Art Space in Seattle. Tim Marsden used to say my dog Buster made him want to have a dog. 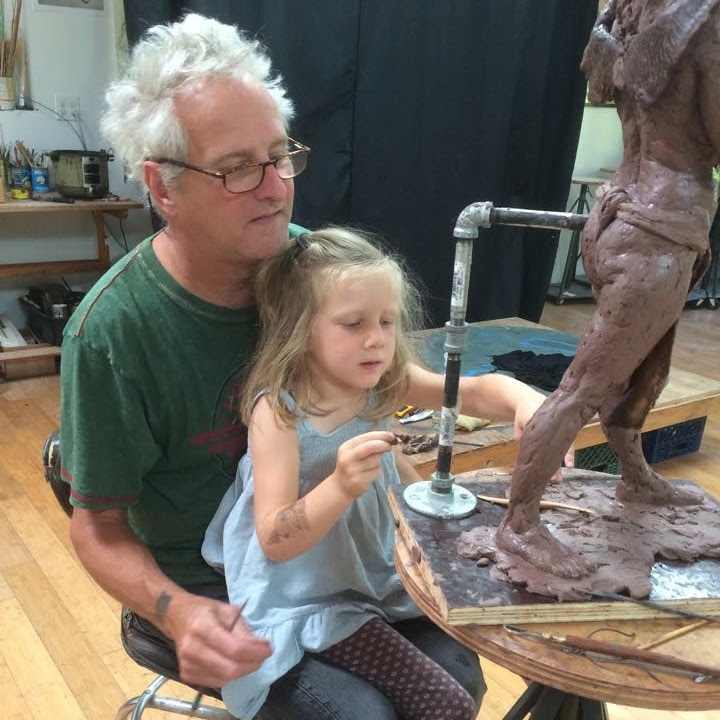 His daughter Olwyn, the subject of this months miniature portrait, is the kind of kid who makes you want to have a kid, like the opposite of birth control. When I first met the Marsdens at Seattle’s SOIL Gallery, Olwyn was still in a stroller. Tim and I became friends and soon hatched the plan to start Artnight. We met like clockwork to make art, each Thursday night for 14 years, and Artnight grew to over a dozen artists. It’s hard to fully express how meaningful that time was for me, to work in a studio full of artists, inspired by the driven people creating all around. I was privileged to watch artists mature, develop themes in their work, and perfect their craft. Since moving north years ago, Artnight is my greatest loss. This is so hard to write. Until now, I have not realized how much I have missed my friend. While this series is about artists inspiring me to take up the challenge of parenthood, of all the artists participating, none has inspired me more than Tim. I love spending time with Tim and Sandy. They are a warm and loving couple, and it just feels great to be around them. Tim loves nothing more than telling a funny story to a room full of people, and Sandy is Tim’s straight man. But nobody makes Tim laugh more than Sandy. Whenever Artnight got together at Tim’s studio, Olwyn joined the group to work on her own projects. Even then, Olwyn was like a little adult to me. I don’t talk about my friends Tim and Sandy and their daughter, but rather my friends Tim, Sandy and Olwyn. Now suddenly my little Olwyn is all grown up and going to college. I don’t know how Tim and Sandy are managing it. Olwyn is confident and headstrong and knows her mind. She is also funny, insightful and warm. I have painted the whole family over the years (including their late dog Nippy), and this is my second painting of Olwyn. See all my paintings of the Marsden’s in my previous post. Olwyn and Tim playing with artist, Christian French’s UFO. After Olwyn was born both Sandy and I both worked part time (I was working a little less than part time, more like infrequent time) until Sandy returned to a more typical schedule. We are both happy we did. The front loading of time with your kid is best done right away and I am sure it helped with the strength of bond we all feel as a family. At the time I was renting studio space from the Two Bells, a small shop front right on 4th Avenue. Olwyn would be in a playpen we had set up in the studio and we would put serious miles on the stroller, running errands and just generally getting overstimulated until Sandy came home. The studio was right next to the apartment as well so everything was within striking distance. Apart from a fairly short stint of having a studio in a factory under the West Seattle bridge I have always had the good fortune to have my studio in the house. While there are a few restrictions borne of such a situation, the pros far outweigh the cons. It also means there is art hanging around all the time which I am certain has had a massive hand in Olwyn’s attitude to the Arts and also in how she navigates the world. Olwyn’s presence rarely, if ever, interfered with with making art. There was no censorship for young innocent eyes, no closed door policy and she was always encouraged to work on her own projects or give me a hand stretching canvas as well as other studio practices. Having to work another job interfered far more with the making of work than having a child. Actually, the Art Museum was a pretty good place to work when Olwyn was younger and sometimes she would join me in the storage areas and write down accession numbers of pieces in the collection. Olwyn has strong memories of the Museum storage right up to the point that she was no longer welcome. Much like if you are raised by wolves, you are not afraid of wolves, so it is with artists and their offspring. Olwyn is neither intimidated by or afraid of art. She sees it for what it is, an exploration of our world through a variety of different means- some more than successful than others executed by human beings as best they can. Warts and all we are all just people…making stuff. Tim Marsden has been a practicing artist for over 30 years. In that time he has shown work internationally but has been based in Seattle since moving from Europe in 1997. Primarily trained as a painter, Marsden’s work has expanded to embrace a number of different media, including but not limited to, sculpture, drawing and animation (film). Marsden’s interest in narrative has been a major influence on his work and he uses storytelling in a variety of different ways to explore the foibles and absurdities humans are subject to. His most recent show entitled “Short Stories” was an installation composed of a number of stand-alone pieces (each composed of a number of stand-alone pieces) in order to create an overall composition in the exhibition space. Artistic influences are far too numerous to mention, although Goya, Turner and the German Expressionists are ever-present ghosts at the feast. Outside of visual art Marsden is also influenced by literature (Notably Nikolai Gogol) and films, again most notably Ealing Comedies. Marsden is currently working on a body of work tentatively titled “Sardine vs. Anchovy, two books of recipes (one in collaboration with Chef Chavez from the eponymous restaurant) and an installation (show) imagining a personal world to which you are all invited. Conor is the son of two artists. I’ve known his father, sculptor Tom Gormally for years. And although we only recently met, I have known of his mother as one of Seattle’s most talented portrait artists. From the first look, I saw Conor as having a classic look. I immediately thought of one of my favorite portrait painters, Gerald Leslie Brockhurst. Brockhurst was born in the late 1800’s and painted portraits of the English gentry and Hollywood stars in the 1930’s. So I dressed Conor up a bit and added a backdrop of Mount Rainier, painted in Brockhurt’s muted style. As Malayka and Tom write about Conor, it feels like looking into my future; and when Malayka describes her conversation with Faye Jones, I remember having the same conversation with my dear friend Andi. More and more I feel bonds of common experience, even with people I have yet to meet, like Faye Jones. Our son Conor turned twenty today, and we enjoyed visiting with him at his college dorm via Facetime. When I first became pregnant, I didn’t know how I would handle being an artist and a mother. Now we have a wonderful grown son, and I’m also grateful for the ways in which being a parent has affected my art practice. Before becoming pregnant, I painted abstract work. I was so fascinated with my body’s changes that I started painting myself in the mirror and then painted Conor as a baby. Over the next couple of years, I developed a commission portrait painting business which I’ve maintained to this day. In the last several years, as Conor has become more independent, I’ve been able to focus on my non-commission paintings and expand my career. I’ve always painted at home which allowed me to be there for Conor in the afternoons, on sick days, and for school events – for which I’m grateful. It also means that Conor has been involved in every part of the art-making process. He regularly gave me feedback on portrait paintings in-progress. Conor is now my go-to business advisor as he has a good head for pricing, negotiation, etc. As a skilled writer, Conor has played a crucial role in that he serves as our editor and composition aid for every grant application, artist statement, and bio that his dad and I write. We consider Conor to be a crucial part of the family art business. I’m the father of three boys; Conor is my youngest son. It was a surprise for me to become a father again so late in life; I love him…he is a gift. It’s been amazing to watch Conor develop as a human being and as a student; he is a wonderful young man and it makes my life richer to journey along with him. I’ve appreciated Conor’s help with writing art applications and creating work in the studio. We enjoy cooking together, watching films, and especially talking sports together and with Conor’s half-brothers Sean and Devlin. Malayka Gormally’s paintings are in over one hundred collections nationwide, including the collections of Safeco Insurance, the City of Kent, and the City of Seattle Portable Works Collection. Her portrait clients have included individuals who have been board members at the Seattle Art Museum, the Henry Gallery, and the Palm Springs Art Museum. She currently has work in 10x10x10xTieton 8th International Small Works Exhibition, and she is preparing for an upcoming two-person exhibition at Spaceworks Gallery in Tacoma. She completed the Artist Trust EDGE Professional Development Program in 2015 and was awarded a 2017 Art Projects Grant by 4Culture to create portraits of immigrant and refugee women in King County. Her website is MalaykaGormally.com. Tom Gormally is known for his whimsical and thought-provoking sculptures that incorporate wood craftsmanship with found objects, diverse materials, and LED lighting. He has exhibited nationally and internationally for 40 years, including the Katonah Museum (NY), Des Moines Art Museum (IA), Nelson-Atkins Museum of Art (KS), among others. He created site-specific sculptures in Seattle and Belfast, Northern Ireland, for the Horsehead International Outdoor Sculpture Exhibitions.Tom has also exhibited large-scale sculptures at the Bellwether International Sculpture Exhibitions, Bellevue, WA. Press coverage includes reviews in Sculpture Magazine and The New Art Examiner as well as BBC TV and radio interviews. Tom is a past-recipient of an NEA award for sculpture and was awarded a 2015 Artist Trust Fellowship. His work can be seen at TomGormallySculpture.com. The children of artists: inspiration for us all. One of the many benefits of working in the arts is meeting many wonderful, creative people. I met Avery Schwartz working at art handling company Artech. Years later his daughter Briar became my intern at the Seattle Art Museum and I was delighted to make a contemporary portrait miniature of her for my Monthly Miniature, Children of Artists series. Briar was a dream intern, and her value went way beyond her “on-paper” qualities. With her hard work ethic, enthusiasm for trying new things, and easy and warm manner, she charmed all of us in the exhibitions department. I can easily see how she has inspired her fathers work over the course of her life and I’m very fortunate to have her pose as the subject for this Monthly Miniature painting. Her strength, confidence, and sassy wit inspired bold, but careful colors, lots of contrast and a direct composition. I’m confident that wherever Briar goes in life, she will be a source of inspiration to all around her. BRIAR – Well let’s see – what about Briar? Twenty seven years ago Polly and I, 40-year-olds, finally scored after three miscarriages. So Briar is our first and only child. Having a kid is a special kind of organic experience that helps me understand what it means to be human. A real thrill to look in to eyes only a few weeks old and see them devouring information around them. And then there are those first steps that irrepressibly are destined to happen. And bulbous full dipes wattling down the sidewalk. One of Briar’s qualities is that, thankfully, she was not shy about wading in to a new group of people and so she, as a kid, acquired friends easily. And Briar has a pretty noble view toward her friends – she is loyal and caring with them and as hard as Polly and I would try to break her connection with some kid, the more she would insist on the friendship. One of the great things for an artist who has children is to bear witness to children’s art and realize what a powerful message that unfettered creativity can be – that is, not affected by expectation. One of my favorites that Briar did was when she broke a bowl, she taped all of the minuscule pieces back together and wrote on the tape a lengthy apology. (Still have the bowl which some day will get a sculpture pedestal and case). And then there was the drawing of the outside of our house when she, in a pique of anger, threw an expressionistic fit. (Still have it). “I live and work in Seattle. My painting experience spans 40 years. In 1971 I was given a degree from the San Francisco Art Institute. I lived and worked in the City for sixteen years, living in and helping to develop an early rendition (in S.F.) of a live/work artist’s building – Project Artaud. I met and married my wife and moved to Seattle. We have a fantastic daughter. I have worked many jobs over the years – everything from carpentry to working in a psychology research lab. In general I hate to work for money and as soon as I am being paid for something I begin to rebel against it. Whatever. My grandparents were mostly Russian immigrants escaping from conscription into the Czar’s army, or from early communism, or the stigma attached to Jewish blood. My mother’s family suffered from her violent and abusive father from which her mother was divorced twice, until her uncle agreed to support them from the proceeds of an investment in land in Los Angeles. Shortly he killed himself and left the property – which became very valuable on the perimeter of LAX- to his sister, my grandmother. Meanwhile my mother, a woman of unusual beauty, upped her stage by marrying a hard-working son of a carpet salesman determined to have his first son become a doctor. Six months in, I’ve just finished my third monthly miniature! Although I find enough time to finish a steady stream of paintings, it goes toward commission work first. Yet it feels oddly appropriate that this series of portrait miniatures should be (comparatively) neglected: while it celebrates both parenting and art making, it also considers them as competing needs. And I contemplate some of the people in my life that I love most, and what they bring into the world. On that note, allow me to introduce Sam Keefe, son of Andrea Wohl Keefe and Colin Keefe. When I had the idea to do this series, I thought of Sam first. His mom Andrea was my studio mate in college, and she is still a dear friend, though we’re thousands of miles apart. When I came to Seattle, she went to the opposite coast, braving the lion’s den of New York City, and is now settled in Philadelphia. We’ve stayed in touch, and I’ve had the privilege to watch Sam grow from afar. “Sam is this really great human being and I feel so lucky to have him in my life. He’s so smart, caring, incredibly loyal and good through and through. I really can’t believe that I’m his mom. He’ll be eleven next month, and sometimes I still feel like his real mom is going to show up. It’s crazy that one day you’re pregnant and the next there is this human being in your life and you’re helping to raise them. Needless to say, I’m still figuring all this out – one day at a time. Colin and I are both artists, and we knew we wanted to have a kid together. But where we both have masters degrees in studio arts, there was nothing we did besides a two hour infant CPR class to prepare for becoming parents. Andrea Wohl Keefe was born and raised in Bridgewater, NJ. She received a BFA from the University of Michigan in Ann Arbor, MI, and an MFA from Miami University in Oxford, OH. Andrea currently lives in Philadelphia, PA with her husband, Colin Keefe, their son, cat and dog. She teaches art at Central High School in Philadelphia and works in her studio. Andrea and Colin also run Mount Airy Contemporary Artists Space. Colin Keefe (born Boston, MA) received an MFA from Cranbrook Academy of Art and a BFA from Washington University. Recent solo exhibitions include Robert Henry Contemporary, New York, NY, Abington Arts Center, Jenkintown, PA, and RHV Fine Art, Brooklyn, NY. His work has been reviewed in the New York Times, Village Voice, Bushwick Daily, Philadelphia Inquirer, Philadelphia City Paper, Toronto Globe and News, LA Times, Sculpture Magazine, theartblog.org and Title Magazine. In addition to his studio practice, Keefe has been curating since 1995 – first, as co-director of 57 Hope in the Williamsburg section of Brooklyn, NY (1995-2001), and currently as co-director of Mount Airy Contemporary (2009-present). Keefe is represented by Robert Henry Contemporary in New York. The muse for my March miniature oil portrait painting of a little girl is Maggie, daughter of Adria and Michael Magrath. This lucky kid has two kind and creative parents, and the family lives on a dreamy property on Vashon Island. Michael works in an absolutely amazing sculpture studio he built on the property. I’ve known Michael for years and have always admired his work. I was excited for the opportunity to learn more about his lovely family for my Monthly Miniature project. Michael sent me around fifty images for inspiration. It was great to see Maggie romping around in the water, the woods and the studio. Whether tromping through tall grass, splashing in the water or goofing around, she had a grin in almost every photo. Like when I first met her mother Adria during an artwalk years ago, I had met a kindred spirit. I think of her as a ‘wild’ child, at home in nature, so I painted her snuggling into the leafy floor of an imagined forest. Michael Magrath has spent most of his life in the Pacific Northwest. He discovered figurative sculpture while in his early thirties, and has since dedicated his life to the betterment of his craft and the furtherance of sculptural art. Primarily self taught, he has nonetheless studied and taught in a number of rich sculptural environments, including the University of Washington, the Florence Academy of Art in Italy, and Gage Art Academy. Reflecting a decade spent in the building trades as a carpenter, painter, foundryman, and shop technician, he brings a craftsman’s approach to his work. Regardless, his interest in the figure naturally steers toward the narrative and symbolic. Of no particular denomination of religious faith, Magrath attempts to excavate, understand, and depict the universal truths that lie at the core of religious and human experience. His primary focus lies in the embodiment and reinterpretation of mythology in contemporary contexts, and is most interested in its potential to reinvigorate the human spirit, particularly in the face of the cynicism of the modern world. Please go to Mike’s website to see examples of his beautiful work and to learn more about him! My first Monthly Miniature of 2017 is a portrait of my son Isaac. I was worried about how I was going to balance motherhood with being an artist, but I’ve been amazed at how well the two are coming together. And how could I not love making this painting? I think every artist parent wants to capture all of their favorite expressions in their little muse. I’m so happy I could record, one careful brushstroke at a time, his sweet little six month old face as it was becoming more aware and loving by the day. For Isaac’s portrait, I chose an image of him looking directly at me. Those of you with kids might be able to remember back to those very early days when something as simple as a direct gaze was a small miracle. Most babies first make eye contact around 4-8 weeks but it’s not uncommon for it to happen as late as 3 months. Isaac was on the later side and didn’t make eye contact frequently when he was little, so when he did, it was very special. With this series, I celebrate those who have taken on the parenting challenge before me. They’ve given me the courage to trust that, with determination, I could be a mother and continue to make my art. I will paint a portrait a dozen different artist’s children. The Children of Artists explores my wonder at watching someone grow and develop, and loving them more than I could have imagined. I meditate on balancing two great passions. And I thank each artist I know who continues to work, particularly those who manage to raise children at the same time. Visit my commissions page to learn about commissioning your own miniature portrait.